CUESA’s Volunteer of the Month program recognizes the dedication and work of some of our most active volunteers. CUESA relies on volunteers to help with education programs, special events, public outreach, and other activities that help fulfill our mission to cultivate a sustainable food system. Learn more about volunteering and sign up here. You can also sign up for our next volunteer orientation on January 9, 2019 here. The spirited chorus “Thank you, farmers!” closes each Foodwise Kids class in the CUESA Kitchen. Since 2012, nearly 10,000 elementary school students have shouted those words and learned about the joy and importance of local and seasonal food. SFUSD Wellness Policy Project Manager Saeeda Hafiz helped develop this farmers market field trip and has contributed in many ways to CUESA’s education work. She joined the CUESA Education Committee in 2013, and that same year delivered Sunday Supper’s keynote talk highlighting youth education. 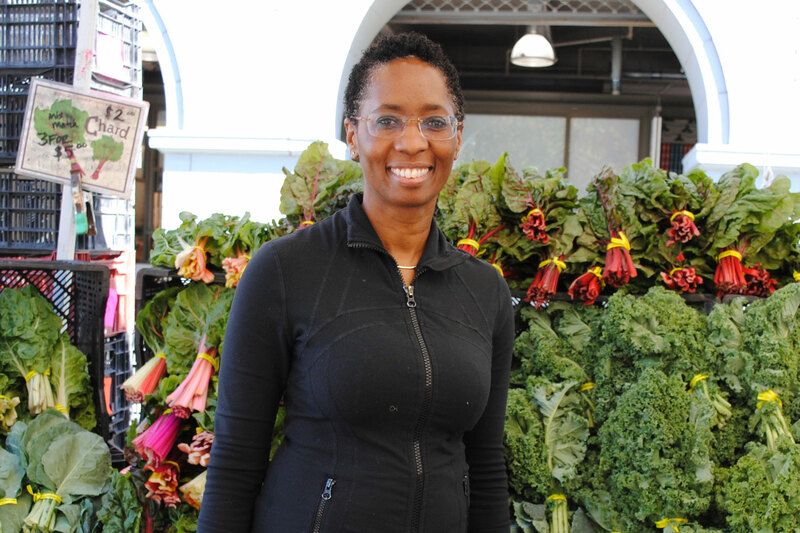 Having demonstrated her commitment to CUESA’s mission, she joined CUESA’s Board of Directors in January 2017. “It has always been a dream of mine to give back by using my passions, skills, and talents that could contribute to the betterment of youth,” says Saeeda. “Saeeda has been central to the Education Committee, helping to shape the direction we are moving in, and grounding our work in a deep consideration of youth voice,” says Director of Education Leigh Gaymon-Jones. “She has also participated in nearly every facet of the education programming—serving as a speaker on our Cultivating Youth Leadership panel discussion, giving a culinary demo at the Ferry Plaza Farmers Market CUESA Classroom, and recently helping to design our new Foodwise Teens health and nutrition curriculum.” Meet Saeeda. Saeeda: When I was able to lower my cholesterol 100 points by merely eating real delicious foods. Health and healing became very important while understanding that food also brings various cultures together. Food made me curious. For example, I like to challenge myself by asking, if I am eating foods from a different culture, do I also have many friends from that culture? Saeeda: I can be found at San Francisco Unified School District (SFUSD) implementing the district’s Wellness Policy Vision—making the healthy choice, the easy, most-desired choice for our students, staff, and families. When I am not at SFUSD, I am either teaching yoga in the Bay Area or on book tour as the author of, The Healing: One Woman’s Journey from Poverty to Inner Riches or enjoying friends. If you can’t find me at any of those places, then I am simply meditating. Saeeda: My favorite part of volunteering is contributing to how education programming develops for our youth at our Foodwise Kids and Schoolyard to Market (Foodwise Teens), along with being an adult nutrition educator (chef) at the Saturday market. Saeeda: My insider tip is to buy, prepare, and eat the fresh produce within the week, even that day. Experiment. Saturday’s taste will be different than the taste on Monday. The fresher flavors are divine, simply divine.